StabiledgeTM performance controls the movement of the center and intermediate ribs enhancing the overall soft handling and on-center feel of the tire which also provides additional dry traction stability for a crisper response. The Evolution TourTM helps to keep you safe through every turn and is designed to provide stability and confidence by gripping and flexing to adjust for varied road conditions. Optimized pitch sequence coupled with the advanced tread pattern layout provides lower in-vehicle noise. We designed the Cooper Evolution TourTM with a tread pattern that keeps your ride quiet even at highway speeds. Listen to music, not your tires. 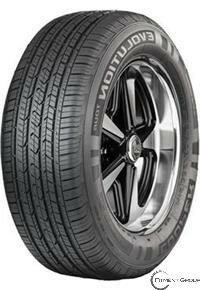 The modern tread compund and tread profile provide even wear and a long tread life. The Evolution TourTM will go the extra mile with features designed for even wear so you can count on them longer and replace them less often, when properly maintained. Light weight construction and design for less rolling mass and increased fuel efficiency. With innovative, lightweight fuel efficent technology, the Evolution TourTM tire can help improve your gas mileage, saving you money over the miles. These sipes are Cooper's trademarked technology used to stabilize the tread elements and provide remarkably responsive handling. 3D micro-gauge sipes provide stability and traction in both wet and dry condiions. They extend the full-depth of the wearable tread which also enhances the worn appearance and contributes to even treadwear throughout the life of the tire. Tackle the seasons with the all-season Evolution TourTM tire, with the grip you need to stay confident on the road, rain or shine. Featureing the proprietary 3D micro-garugeTM siping technology from Cooper®, tiny channels in the tire known as "sipes" are designed to improve traction in rain and light snow conditions. In wet weather, the channels work to aid in evacuating water away from the tire tread. In snowy conditions, the channels assist in retaining snow in the tread of the tire for better snow-on-snow traction. In addition, the sipes create more griping and biting edges on the surface of the tire, which improves the tire's traction and handling. The 3D micro-gaugeTM siping technology from Cooper Tires allows the sipes or biting edges to go deep into the tread, providing consistent performance throughout the life of the tire. The 5-rib tread pattern has more lateral grooves around the circumference of the tire for increased wet traction and improved handling in adverse weather conditions. Speeds the ability of the Evolution Tour to move water away from the tire, reducing the potential for hydroplaning.